Saturday's disappointing result was a reminder that effort alone is not enough to win a football match. Our inability to craft and convert goal scoring chances combined with a defensive error resulted in a loss. Stephen Robinson was left to rue his side's lack of creativity in the final third when he made his post-match comments. His reference to the good start that Hearts have made to the season was an attempt to lift a disappointed dressing room. 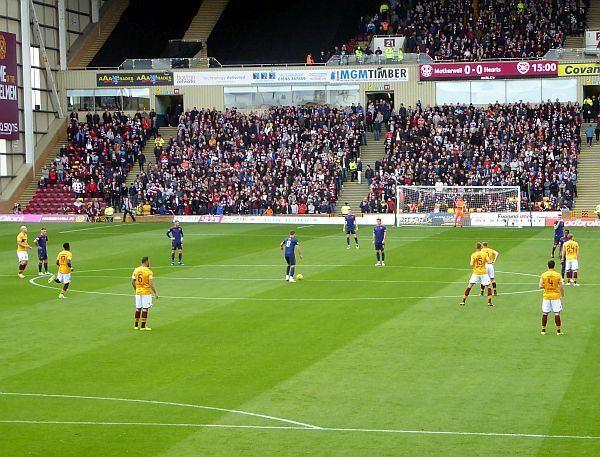 There were no lack of determination or effort from Motherwell just an inability to get the ball into the opposition net. Those who make repeated references to our "physicality" would be well advised to have a look at the side Craig Levein has put together. His team is packed with big strong boys and they know how to put it about. There was a shared moment of horror as we realised that McHugh's pass-back was horribly short. The race between Ikpeazu and Carson promised a collision and our man paid the price. We wish him a speedy recovery. Results elsewhere helped us retain our lowly ninth place but with only four points on the board after five matches it can hardly be viewed as a good start to the campaign. Anyone looking for a positive spin will point out that we have already faced three of the top five and suggest that a less demanding period lies ahead. Next up is a trip to Pittodrie. If an extra incentive is needed a look at the table will reveal that Aberdeen have a two point advantage. A win would have us leapfrog them. That would be cause for a Saturday night celebration.